Months ago, when the first trailer for Terra Formars painted the live action film as a comedy, I expected it to be terrible. Unsurprisingly, it is—though not in the ways I expected back then. ...Okay, not JUST in the ways I expected back then. 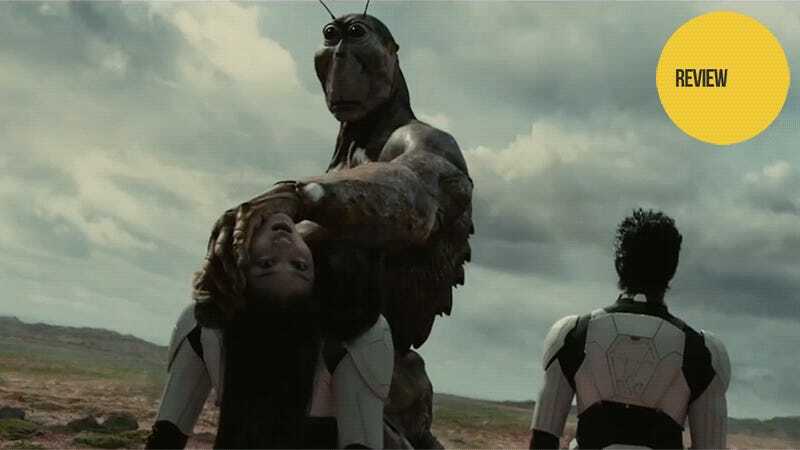 The Terra Formars franchise in general follows groups of humans sent to a Mars which has been largely terraformed by cockroaches sent to the red planet generations before. The problem is these roaches have evolved into humanoids that have an instinctive drive to squash humans (similar to how most people feel about roaches). To combat the super-strong, super-fast, super-hard-to-kill roaches, the groups of astronauts sent to Mars are genetically altered so they can draw on their own insect-based powers. The live action film keeps this same basic premise but somehow manages to make the whole thing boring. For the film, our heroes are a group of lowlifes and criminals going to Mars for the promise of having their crimes expunged—and a big pile of money given as a bonus. Recruited by eccentric billionaire Ko Honda, the group is only told they are going to kill cockroaches, not that said roaches have evolved into death machines on legs. It’s plainly a suicide mission—not that any of the characters are smart enough to see this obvious fact. In fact, the group doesn’t even learn that they have bug powers until after several of them have been killed by unexpected encounters with the roaches. Therein lies one of the film’s most problematic aspects. There are 14 characters on Mars. Several only get a single line or two before they die—leaving no time or reason to form an emotional connection. Thanks to this, their deaths have no meaning in the plot. Beyond them, the rest of the characters are largely one note and can be described in two words apiece: thrill seeker, disgraced soldier, creepy murderer, failed terrorist, former yakuza, etc. Only the main character, Shokichi Komachi, and the team’s hacker, Ichiro Hiruma, get anything resembling a true backstory. The biggest problem with the Terra Formars film is that it doesn’t seem to know what it wants to be: a serious sci-fi piece or a comedy. Because of this the tone of the film is all over the place. On one hand we have stylized violence as people are killed in various horrible ways and super-powered action movie fight scenes. On the other hand we have more than a few slapstick moments from our heroes and a narrator who pops in to explain each person’s powers or just to belittle the heroes. And then we have Shun Oguri as Honda. Now, don’t get me wrong, I like Oguri as an actor and have watched dozens of dramas and films with him starring. I know he is a fine actor. However, the only way to describe Oguri’s performance in Terra Formars is to imagine that the film’s director, Takashi Miike, made him watch Gary Oldman in The Fifth Element and told him to kick that up half a dozen notches. It is so far over the top that it borders on the surreal—and it is the only aspect of the film that is even somewhat captivating (though for all the wrong reasons). Much of the film is nonsensical—both from the roach and human perspectives. The roaches have super-speed, but only use it once. One man is a jet engine with seemingly infinite fuel. The roaches seem to travel by forming literal tidal waves out of themselves—which is even odder when it’s revealed that the roaches can fly faster than a rocket engine at escape velocity. One character spends most of the movie somehow living inside one of the roaches while a dead character comes back to life as a moth with explosive powers despite never using the serum that activates the human’s bug powers. It’s a mess, is what I am saying. The film doesn’t measure up visually either. While the sets and costumes (namely the space suit armor) look good enough, the rest of the film is a mixture of Power Ranger’s level makeup effects and some of the fakest-looking CG I’ve seen since the Dragon Ball live action film. The roaches are almost entirely CG while the heroes are all filmed on green screen with makeup. You can tell that the actors are never interacting with the monsters they are supposedly fighting. I wish I could say that Terra Formars is good. Hell, I wish I could say that Terra Formars is so bad it’s good, but it isn’t. It’s just plain bad. Suffering from cringeworthy CG and tonal dissonance in its story, it is a film that is more boring than anything else. Fan of the franchise or newcomer, this is a film not worth your time or money—even as rental. Do yourself a favor and pretend it doesn’t exist. That’s what I plan to do. Terra Formars was released in Japanese theaters on April 29, 2016. There is no word on a Western release.